1940th he went to Kiev and worked on a shoe factory in Kurenevka district. (ZAKARPATSKII region) where he continued to live after his service. he was "invited" in connection of the inheritance on his name from Chicago. He was "brain-washed" in KGB, and was obliged to renounce his relatives. damage my own service as an officer in the army at that time. manage to find him in Uzhgorod?! It means that they exist today! About my name – Boris. The father has named me it in honour of brother Boris. I am looking for my old friends, Sasha (Alexandr Victorovich Ivanov)Date of Birth 29.02.1960 in Vladivastock. Also friends Oleg and Lena, who had a daughter Vasillici. Last known address was ulitsa linkova, d 99, k 3, kv 48. please let me know any news. My telephone 0044 1225 869054. During war of 1941-45 we have lost the relatives native. Now it would be desirable to find gone. but anybody from relatives has not found in alive. in Shereshevo and married the girl from Antopol. At them two daughters were born. who can remembers that happens with them during war. at the left their relative, it is possible from Antopol. Ищу родных моего деда Байгуз Ивана Михайловича(Bajguz Ioann). Родился 26 серпня 1905 року в Sokolke недалеко от Белостока. Hello, my Name is Richard Parasevic. I,am search someone the Baranowitsche Lived and can help me. My father Peter Parasevic born in Baranovicz white russia at the 24.06.1922 the write of the Name was in front of the war Parasewitsch or Parasiewitsch. My Grandfather Name was Alexander Parasevic is Born to Kiev 1897 and the Name of Grandmother Lydia Stegmann born 1899 Baranowitsche ? My Grandfather was Smith.My father have sombebody brothers or sisters the he never saw. He was 1939 with him cousin Stegmann Peter born 1923? as Student for Language and Maths to france as the war from broken to germany. Who white enything about these family from Baranovicz- Baranovitch-Baranowitsche white russia???? Suche jemanden der in Baranovicz lebt und mir helfen kann. Mein Vater Peter Parasevic geboren 24.06.1922 stammte aus Baranovicz die Schreibweise des Namens soll vor dem Krieg Parasewitsch oder Parasiewitsch gewessen sein.Meine Großmutter aus Baranovicz hieß Stegmann Lydia mein Opa war Schmied und diese haben in Smolensk geheiratet. Mein Vater hatte angeblich noch Geschwister die er nie mehr sah. Angeblich war er 1939 mit seinem Cousin Peter Stegmann(lebte in Frankreich)als Student für Sprache und Mathematik in Frankreich als der Krieg ausbrach. Hy! I am looking for some relativs of Matt Turk and Leota Turk. They moved in San Diego around year 1900. Leota was second wife of Matt or Matija, this is a name which we using in Slovenia for him. Name of first wife we don´t know, we hear that he have fifteen children whith she, but we are not sure about that. Matt(Mathias, Matija) was born in year 1889 in Slovenia and he die in year 1974 in San Diego. Matt is brother of my great-grandfather. My G-Mother (my mother's Sarra Eidelshtein mom) maden name was Dzivinissky (Divinissky). 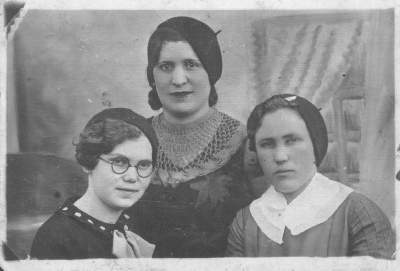 My mom was a orphan from WWI and she grows in Eishiskies (Lithuania). Her mother's brother and Father had a watermill. If somebody have information, I appriciate. Я ищу информацию о с.Скупово Пружанского уезда. Оттуда родом мои предки по деду, крестьяне (фамилия Ярошевич). Знаю лишь, что это село было где-то в районе Беловежской Пущи и примерно в 1910-1915 г царь выкупил у них эти земли и они переселились на территорию нынешней Волынской области Украины. Буду рад любой информации об этом селе.